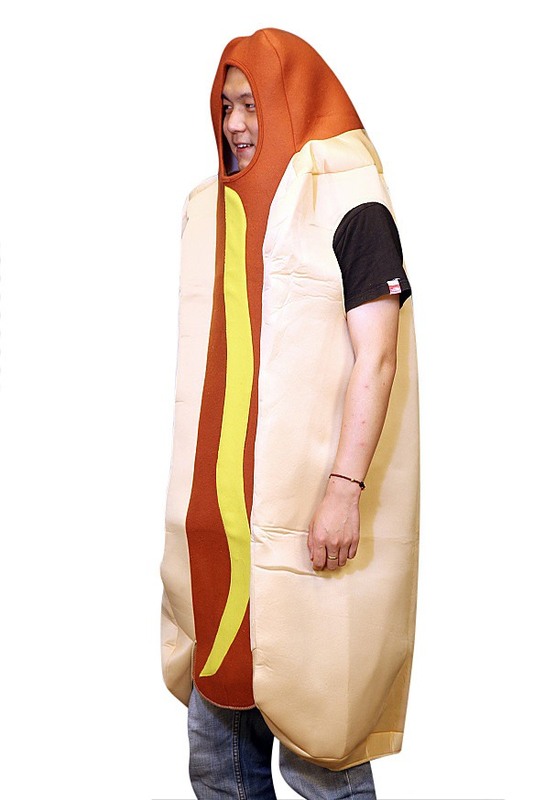 Delight your friends at a holiday gathering or masquerade party with this comical Hotdog Costume. You"ll be sure to leave a memorable impression when you arrive at the party dressed as one of the nation"s favorite snacks! 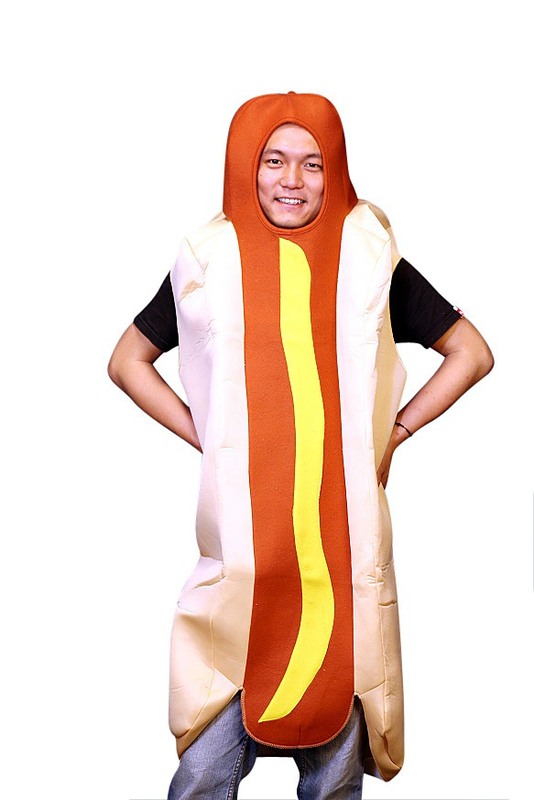 This colorful Hotdog Costume is adult-sized, easy to slip on and comfortable to wear. There are generous-sized slots in the "hotdog bun" portion of the costume for your arms so you are not confined in the least. The bright coloring of the costume will draw everyone"s attention. A bright yellow stream of mustard runs along the length of the red hotdog. The light brown hotdog bun completes the ensemble. 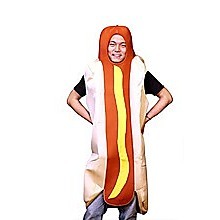 Your face fits in a large cut-out under what is one end of the hotdog. The body of the hotdog costume hangs only just past the knees. This soft material and design leaves the wearer free of any encumbrance and able to move about and sit or stand without any restriction. The costume is of a one-size-fits-all design. 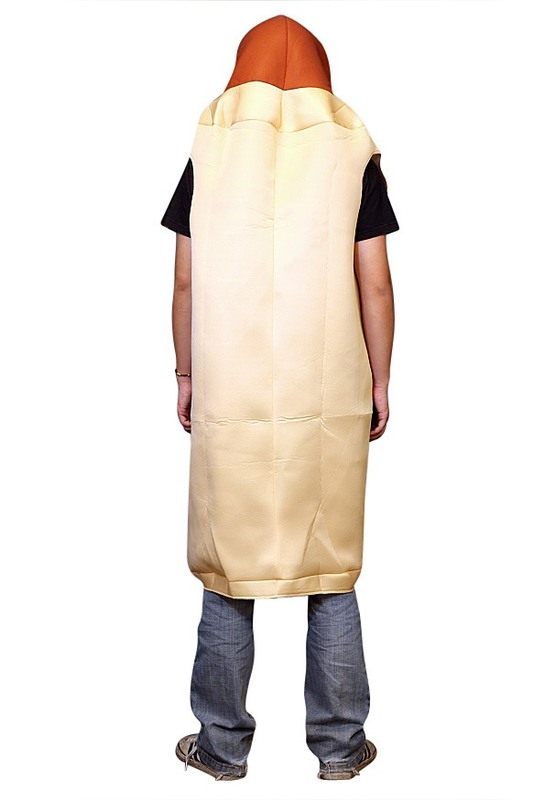 The adult-sized Hotdog Costume can easily accommodate an adult male of the following size: between 5"7" to 6"3" in height; a chest circumference between 42" to 48"; and, a waist size between 35" to 41". Surprise your friends and come as a big juicy Hotdog the next chance you get! Cowboy Inflatable Fan-Operated Costume Howdy, partner! Rustle up some fun for your next get-together with our Cowboy Inflatable Fan-Operated Costume. You'll ride to the party in style, but you won't break a sweat courtesy of the costume's super-lightweight material. This durable, one-size-fits..